A video of his arrest recently surfaced on social media and has since gone viral. 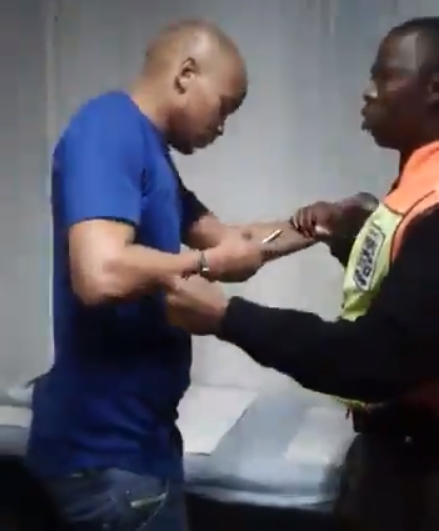 In the video, the SuperSport analyst can be seen engaging in a scuffle with a female Joburg Metro Police Department Officer (JMPD) who appeared to be recording and taking pictures of him while he was being processed by another officer. However, while many slammed Nkosi’s conduct, some also called into question the officers’ conduct, suggesting they violated Nkosi’s rights by recording and taking pictures of him. Why were those Metro Police Officials taking videos and pics of #SiyabongaNkosi? What were they trying to achieve? Are they always take pics of all the people they arrest? I don't know if it's only me who think that they were harassing him. JMPD’s chief superintendent Wayne Minnaar confirmed to TshisaLIVE that Nkosi was arrested on charges of drunken driving. Minner told the publication: "What I can confirm with regards to the video that is out, is that that person in the video is being charged with drunken driving. The incident was on March 26 and that incident was at Sandton Metro police office."